If you are a regular reader of this blog then you know that we own two Ultimaker 3D printers, the very machines we use for all the prints you can see in our blog posts. The Ultimaker is a Fused Filament Fabrication (FFF) printer which means that its core working principle is based on melting filament in order to liquify it before extruding it into the desired 3D shape. Find more in-depth information about FFF in this article. Fused Filament Fabrication is the most widely spread technology in consumer 3D printing, but it is not the only one. An alternative technology is Stereolithography, also known as SL or SLA (SLA is the short for sterelithography apparatus, in other words the SL 3D printer). We were lucky to be able to borrow a Form1 SL 3D printer from a friend (merci Xavier!). Having played around with it for a few weeks now it is time to gather our thoughts and put them into a review. Just as FFF, stereolithography is an additive manufacturing process that creates or prints a solid object layer by layer. Contrary to FFF however, stereolithography does not melt a polymer filament in order to liquify it before printing a 3D object. SL works by hardening an already liquid resin, contained in a resin tank, into a solid object. The resin, a so-called photopolymer resin is cured by an ultraviolet laser beam. For each layer, the laser beam traces a cross-section of the part pattern on the surface of the liquid resin. Being exposed to the ultraviolet light hardens the pattern traced on the resin, joining it to the layer below. Once a layer has been cured, the build platform ascends by a distance equal to the thickness of a single layer, typically 0.1mm to 0.025mm. The laser beam then cures the next layer and that process is repeated over and over until the complete part is built. 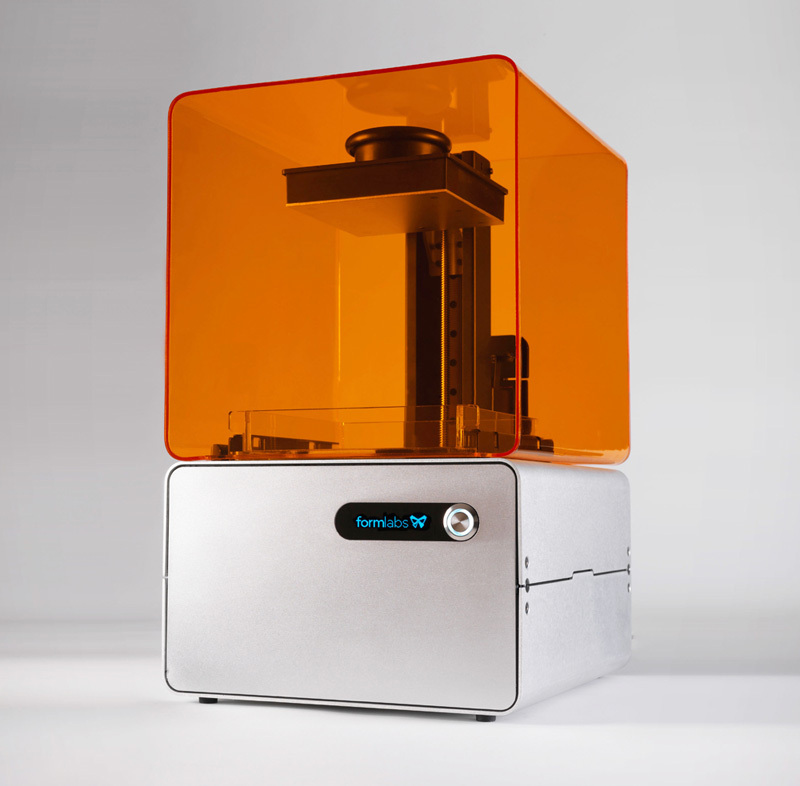 The Form1 is one of the few SL 3D home printers currently available. To give you some idea, 3Ders.org’s comprehensive 3D printer listing currently only features eleven SLAs (some of which are still under development) compared to two hundred and two FFF printers. Quite clearly, SL 3D printers are not part of the consumer 3D printing mainstream. In case you wonder why, the below table already gives you some hints. Other than the fact that there is limited choice of machines, SL printers are also quite a bit more expensive than FFF printers. 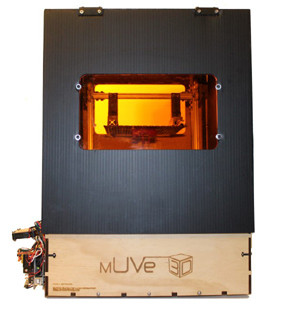 At $1099 the mUVe1 3D Printer Classic (in DIY kit form) is a notable exception but the average SLA costs around $2670 putting the SL machines clearly in the upper price bracket of desktop 3D printers. 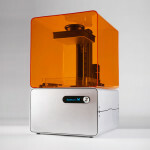 The Form1 is made by Formlabs, a US-based company. The founders of Formlabs, Maxim Lobovsky, David Cranor and Natan Linder met as graduate students at MIT in 2009. They were inspired by the promise of 3D printing technology but frustrated by the price and complexity of industrial grade machines. In 2011, the three founders decided to design an affordable, high-resolution desktop 3D printer. 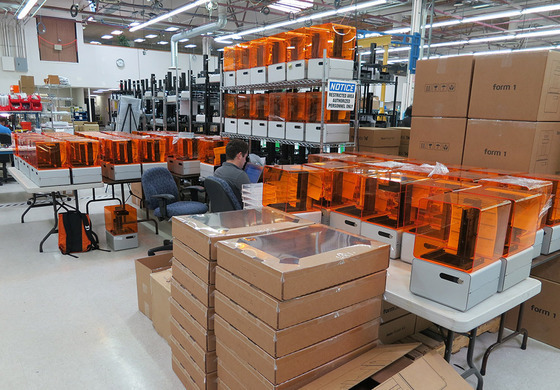 In September 2012, the Form1 was officially announced and Formlabs turned to the crowdfunding platform Kickstarter to secure the financing for its inaugural production run. The Kickstarter campaign was highly successful, the company secured close to $3 million and by December 2013 the first 1000 printers were shipped to their new owners. Today, the company has grown into a 35 person team and occupies a 11.000-square-foot facility in Somerville, Massachusetts. Having secured another financing round of $19 million, Formlabs looks set for some serious expansion over the coming months and years. As mentioned before, the Form1 doesn’t come cheap. However, for the $3299 (€2799), you get more than just a 3D printer. 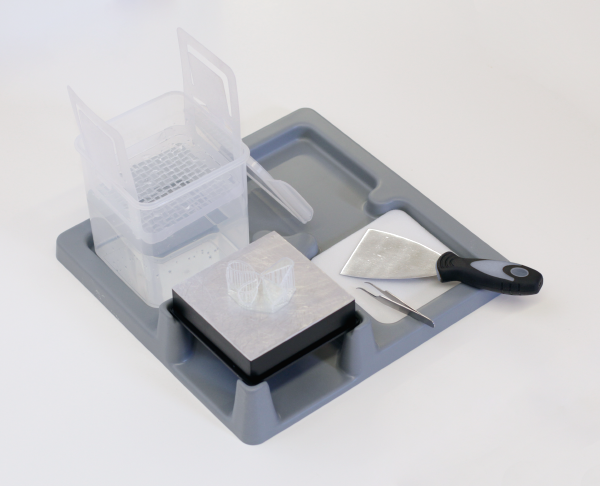 You get a complete kit, consisting of the Form1 (including a 1-year warranty), the PreForm software, 1L of photopolymer resin and the so-called Form Finish Kit. Essentially, Formlabs provide you with everything that you need to get up and running straight away. Other than the pure technical specs I should probably also mention that the Form1 looks great. Its brushed aluminium chassis with the bright orange cover makes it look like a futuristic fish tank but one that is an eye catcher on any desk. I can’t speak to the complete unboxing experience since I received the Form1 from a friend who had used it previously. Setting up the machine is very straightforward though and you can be up and running in well under 30 minutes. There is a handy getting started video and excellent documentation on the Formlabs website. The single-button interface plus the two only cable connections (power and USB) don’t leave much room for error when it comes to installation. In order to proceed to the first print you also need to fill the resin tank with resin. This is not complicated but you need to make sure not to fill the tank above the maximum fill line, otherwise you are in for a major resin spill the first time the build platform descends into the tank. Initially I was surprised by how little resin fits in the tank but then realized that the resin is re-distributed evenly across the tank by a gentle tilting motion after the curing of each layer. As a final step one should also install the Finish Kit. It pays to have this close to the printer since you don’t want to have to move the fresh prints very far when they are still oozing with resin. The PreForm software is both the front-end used to drive your printer as it is the slicer that prepares your .stl models for printing. PreForm has all the features and tools you might expect such as scaling, duplicating, orienting and placing the object on the build platform. PreForm also lets you set the layer thickness for your print as well as it lets you create support structures in case you print an object with overhangs. Overall, PreForm is very intuitive, it certainly has a lot less options and settings to tweak compared to slicers like Skeinforge or Cura for example. Initially, it felt strange to have only a few settings to adjust, especially since there are only three pre-sets for the layer thickness: 0.1mm, 0.05mm and 0.025mm. However, after a few prints you realize that those basic settings are sufficient since the print results don’t leave anything to be desired for. The one setting that you may want to experiment with a bit is the support structures. PreForm lets you tweak both the ‘support density’ and the ‘touch-point size’. I tended to decrease those from the default settings in order to make it easier to detach the support material from the finished print. PreForm also has a function that alerts you when you have loaded an .stl file that has ‘integrity issues’. This means that the surface of the 3D model is not closed (aka watertight), a pre-condition for 3D printing. PreForm will attempt to repair the model and close the surface. On the couple of models where I tried to apply the auto-repair function it didn’t really work, the models still printed with holes in them. I would need to explore this feature further to better understand its capabilities and limitations. 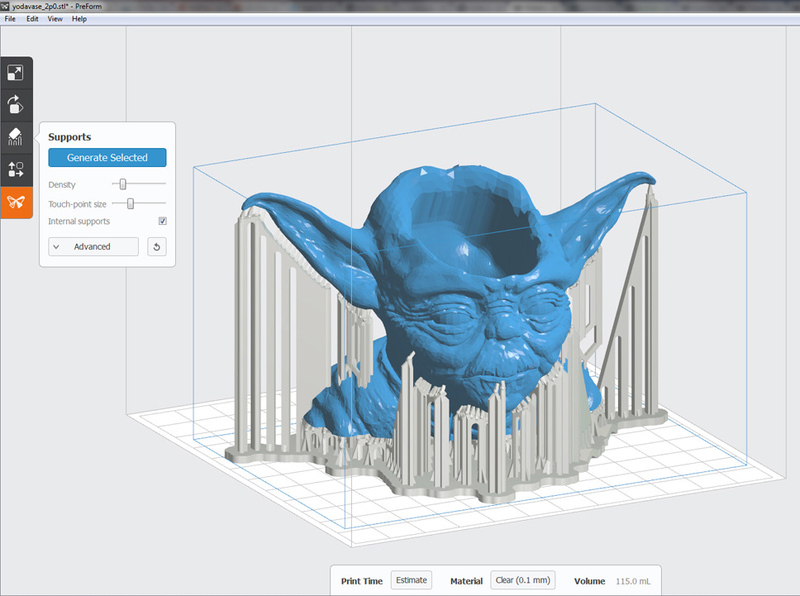 Using PreForm to set the supports before launching the Yoda vase print. Printing with the Form1 is pretty unspectecular. This is not to say that you won’t catch yourself mesmerized by the machine without realizing that once again half an hour has gone by while you have been watching your print emerge from the resin tank. 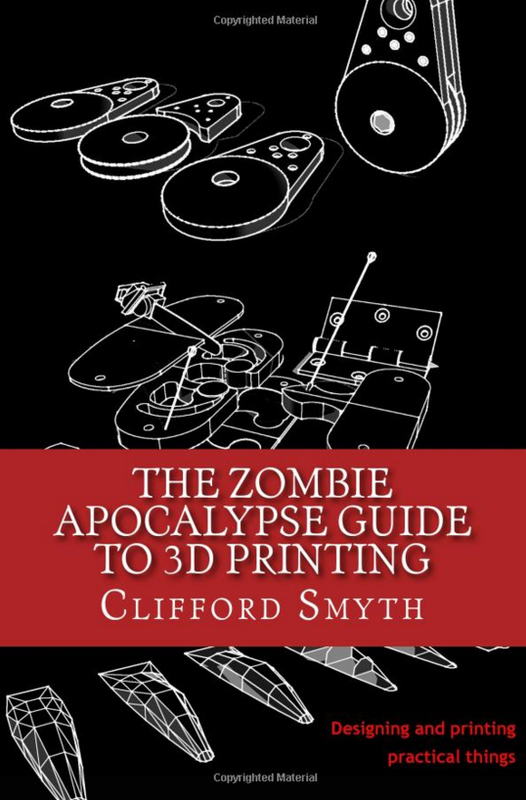 But, SL 3D printing has a lot less drama to it than FFF 3D printing: there is no filament spools to get entangled, no nozzle clogging, no overheating hot-ends, no disastrous warps or other similar entertaining events. Once your model is loaded in PreForm and you are satisfied with the support structures you simply hit print (or ‘Form’ as the FormLabs guys call it) and the Form1 sets to work. A really neat feature is the in-built memory that lets you unplug the USB cable after the print has been spooled. This way there is no need to keep your computer connected to the printer during the multi-hour prints. Printing is slow though and switching to one of the higher quality settings (25 or 50 microns) adds hours of printing time. That being said, I found the ‘lowest quality’ setting at 100 microns to generate fantastic results that were not easily distinguished from the same prints at a higher resolution. The only thing you need to be watching out for is to check whether the print sticks to the build platform after the first 20-30 minutes of printing. During one particular test, I tried to print the Easter Egg print without support material and it did not stick to the platform (I managed to do the same print on the Ultimaker Original, also without support, and it worked). I then re-launched the print and it failed again since I did not realize that the earlier print was still floating in the resin blocking the laser beam. I used some tweezers to fish the bits and pieces of the previous print from the resin tank, re-sliced the print with support material and got it to work fine. Unlike 3D prints realized with a FFF printer, parts made on a SL machine are not ready for use once the printing process is complete: first, you need to detach the printed part from the platform which often requires considerable force especially if you printed with a larger support structure. The tools supplied with the Finish Kit come in handy but at this point the print is still covered in sticky resin such that wearing disposable gloves is mandatory. Once detached the part then needs to be soaked in Isopropyl alcohol for 10 minutes in order to wash away any residual resin. Again, the Finish Kit supplies everything you need in terms of wash buckets and tweezers. After the alcohol bath the print needs to dry before you can process it further. Given that FormLabs choice of resin colors is somewhat bland (the current color choices are: transparent, white, grey and black) you will probably want to color your prints in some way or another. I found that using acrylic resin spray paint works well on the resin prints. Once you got the primer coat sprayed on you can color the part in any way you like. Impressive precision: without any doubt, the precision of the Form1 is remarkable. Further, it is not only the precision itself but also the ease at which you can achieve this precision that certainly puts this SL printer a category above any FFF printer. An excellent package: when you buy the Form1 you do not just buy a SL 3D printer. You buy a well-thought-out, complete package consisting of hardware and software that works together flawlessly and that has you covered for the full 3D print process from slicing to finishing. This is in stark contrast to a lot of FFF printers to force you to work with a potpourri of software and consumables. No adhesion or warping issues: generally speaking, adhesion to the build platform is a non-issue with the Form1. Other than for the Easter Egg print without support structures, I didn’t encounter any issues with prints not sticking to the platform. Not having to deal with warping issues was another very refreshing aspect of using the SL printer. As any user of a FFF 3D printer knows, warping can be a major headache that requires a lot of trial and error to get under control. With a SL printer this is no concern since the resin is hardened on the spot and doesn’t retract after the object has been removed from the printer. Certainly a big plus for SLAs! Low noise levels: another very positive aspect of working with the Form1 is that it makes very little noise. Compared to a FFF printer, there are no stepper motors for the X and Y axis or the extruder such that the machines emits hardly any noise. Frankly, the noise emitted by my Ultimaker Original can be very distracting or even annoying especially after a few hours of printing. The Form1 however, has been sitting on my desk all along and I could happily write a blog post without being distracted by its gentle humming. Material handling & resin disposal: if there is one thing that I really didn’t like about the Form1 then it is having to deal with the photopolymer resin. It is sticky, it is messy, it requires you to wear gloves and it is not clear how you dispose of it properly. Taking a look at the material data sheet makes you realize that you are using something that is classified as ‘irritant substance’ which can cause skin irritation, nausea and headaches if not handled properly. When it comes to resin disposal, the material data sheet gets really vague and instructs you as follows: ‘Avoid release to the environment. Dispose of in accordance with all applicable federal, state and local regulations.’ I doubt that the average citizen knows what to do based on those instructions, I certainly don’t. 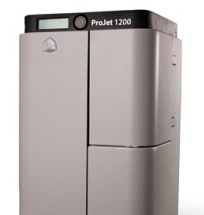 Total cost of ownership: at $3299 (€2799) the Form1 is not a cheap printer to start with. However, any interested buyer should also keep in mind the total cost of ownership and that is certainly considerable for this machine: a liter of photopolymer resin sets you back $149 (€125). If you want to print in another color it is recommended that you use a separate resin tank that costs another $59 (€49) and an additional build platform that costs $99 (€85). Don’t forget the the Isopropyl alcohol, the disposable gloves and the rolls of paper towels that go with the post-processing either. Lack of material choice & colors: transparent, white, grey and black, that’s the grand resin color choice you have with the Form1. And while I am sure that FormLabs will develop additional colors over time, one should keep in mind that the minuscule market penetration of SL printers also means that only very few companies will invest into R&D in this space. Unless the adoption rate of SL printers changes significantly, the photopolymer resin market is unlikely to see the kind of dynamics currently happening in the thermoplastic filament market. Printing speed: given the precision of the SL prints this may not come as surpise. This is not to say that FFF printers are speed demons but the slicers settings give you a lot more room to influence the printing speed. Doing a quick and dirty test print is not something you should expect from the Form1, you’ll simply have to be very patient waiting for your prints. On the upside though, I never felt uncomfortable letting the Form1 unsupervised over night. Unlike with the FFF printers there is a lot less that can go wrong such that you can set up your prints to complete while you sleep (provided there is enough resin in the tank). Small build volume: the 125 x 125 x 165 mm build platform makes for a build volume of 2578cm³. 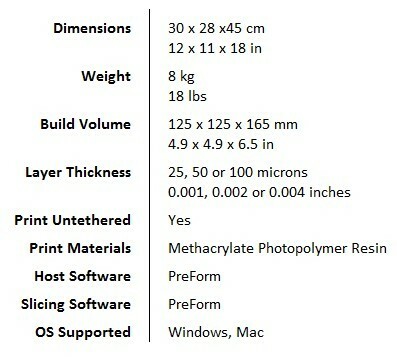 This is mid-range for SL printers but certainly small compared to the build volume of the average FFF 3D printer. Something you may want to consider if you plan to make larger sized 3D prints. 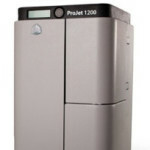 From the get-go, FormLabs targeted their SL printer at the ‘prosumer’ rather than the ‘consumer’ market. This is reflected in the machine, its price and its field of applications. If you are looking for an entry level 3D printer, the Form1 is probably not your first pick. Not only is it expensive to buy and operate but this is also not a machine to install in your living room or office. 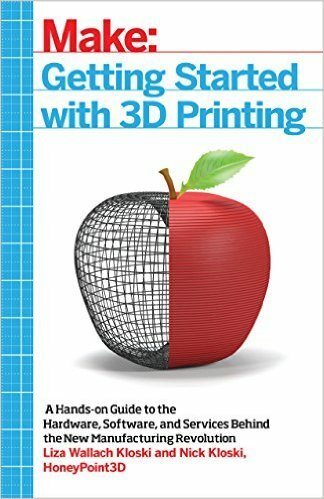 A beginner who wants to explore 3D printing is likely better served with a mainstream FFF printer. Should budget be less of a concern of yours though and if you regularly print 3D parts that require a very high degree of precision then the Form1 is an investment you won’t regret. Jewelery designers, architects or engineers will appreciate the degree of detail that can be achieved with this top-notch machine. Professionals are also more likely to be have the right workshop environment to cater for the Form1 and the post processing activities that the 3D printed parts require. 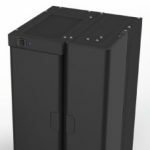 Within the category of SLA printers the Form1 is undoubtedly a reference: a well-designed, upgradeable machine that also comes with professional support and a growing user community, something that not every manufacturer can match. I should mention that while I was completing this write-up, FormLabs announced their next generation printer, the Form1+. The Form1+ is an evolution of the Form1 (an upgrade kit is available for $1200) that comes with a next generation laser, an updated galvanometer control board and a redesigned resin tank. The new machine is said to be up to 50% faster than its predecessor which is certainly yet another step in the right direction for FormLabs. Formlabs is a risky printer – it does not perform as advertised. I bought it because of its high resolution, but I can’t successfully print models that work perfectly on FDM and Polyjet hardware. I quickly realized that this 3d printer works only under perfect model conditions. I asked Formlabs to “do the right thing” and take it back only after having it for a week and they have stonewalled me with a futile “let me work with you” approach – they absolutely don’t care AT ALL that it will consume many many hours of my time to troubleshoot. They host a support site with topics like “nightmare”…I suggest you look at these topics and other 3rd party sites before buying this printer. Its a bummer – I think the design looks beautiful, and I would love to have this resolution in a reliable way…this 3d printer is a $3700 unrecoverable disappointment. Thanks for your feedback. Sorry to hear that you had such a bad experience with the Form1. I would be interested to see what models you were struggling with since I did not encounter any issues when testing the Form1. 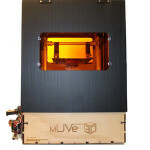 It is generally recognized as one of the best SLA 3D printers on the market. As with all 3D printers today, no machine is perfect but the Form1 should deliver good, reliable prints.